The UPA government today announced a slew of measures like ban on export of pulses, allowing private players to import wheat and limited import of sugar to arrest spiralling prices. Within hours of the mega deal to acquire Air Sahara by Jet Airways for Rs 2,300 crore collapsing last night, Sahara Group resumed charge of its airlines and started normal operations. The two sides also swung into action to minimise damages in the face of legal actions initiated by both. Will the Poonch-Rawalkot bus help improve Indo-Pak ties? 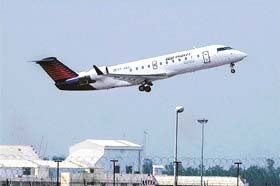 An Air Sahara plane takes off from the Palam domestic airport on Thursday. Air Sahara resumed its operations after the takeover of the airlines by Jet Airways collapsed on Wednesday night. Crores of rupees are missing from the accounts of the Punjab State Council of Education Research and Training. More than Rs 3 crore was given as "temporary advance" to officials but no bills exist to prove the utilisation of the money. Punjab Chief Minister Amarinder Singh today said his government would bring a legislation to ease the problem of rural indebtness in the state. The Chief Minister, who met Prime Minister Manmohan Singh today, said rural indebtness had led to suicides by farmers in the state. In a move which could ultimately help bring the ULFA leadership to the ‘‘direct’’ talks, the Centre today decided to “favourably” consider the release of five jailed leaders of the banned ULFA in consultation with the Assam Government. The court of inquiry investigating alleged molestation of a lady officer at the hands of her superior in Nagrota, near Jammu, has held the accused officer blameworthy on several counts and has recommended that action be initiated against him, it is learnt.